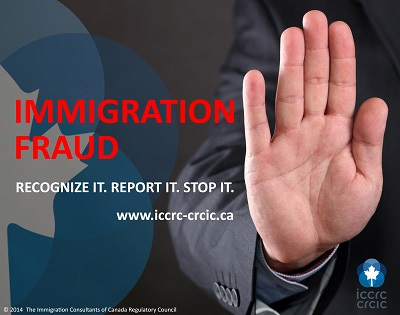 Anyone who provides Canadian immigration advice for a fee, whether in Canada OR abroad, MUST be a member of the ICCRC(Immigration Consultants of Canada Regulatory Council). These consultants are called RCIC(Regulated Canadian Immigration Consultant) and have the education, knowledge, ethics and license to be able to practice their profession. A client wishing to retain a consultant should understand the differences between a Regulated consultant and non-regulated consultant. Regulated consultants have gone through a rigorous process to be able to practice their profession, by completing an immigration practitioner’s diploma, taking a successful full skills exam, English testing as well as police clearance. It is a rigorous process to ensure the profession is safeguarded and only competent advisors are given the right to practice. RCICs are required to follow a strict Code of Ethics and Professional Conduct. They are accountable to the ICCRC, are insured and are responsible for all immigration advice given. When clients use the services of an unauthorized consultant, there is absolutely no protection for the client. Please remember that here at Illimite Migration FZE, we are regulated and authorized to answer any of your queries regarding immigration. The fact that we CAN sign off on your applications means that WE are held accountable for all we do! In order to verify whether a consultant is a member of ICCRC, please go to https://secure.iccrc-crcic.ca/search-new/EN and type in the RCIC # or search by name. This will assure you of the quality of our services.